Most of us have heard that chocolate is not good for dogs, but just how bad is it? And what happens if dogs eat chocolate? It actually depends on how much and what type of chocolate a dog eats. Read on to find out everything you need to know about dogs and chocolate toxicity. A beagle trying to eat some chocolate croissants. Photography by Katie_Martynova/Thinkstock. 1. Methylxanthines are the real reasons for chocolate poisoning in dogs. Two substances found in cacao (chocolate’s main ingredient) called methylxanthines (theobromine and caffeine) are to blame for dogs and chocolate toxicity. On that note, anything containing caffeine is also toxic to dogs, including coffee (especially beans and grounds), tea (especially tea bags), energy drinks, soda and over-the-counter caffeine pills. 2. The type of chocolate your dog eats matters. Different types of chocolate contain different levels of theobromine and caffeine. The more concentrated the chocolate product, the more actual chocolate it contains and the more dangerous it is for dogs to consume. “Baking chocolate is the worst,” says Scott Fausel, medical director of VCA Sinking Spring in Sinking Spring, Pennsylvania. “Things that are just chocolate sweetened like brownies are usually less intensely toxic.” Types of chocolate from most to least toxic are as follows: unsweetened dry cocoa powder, baking chocolate, dark chocolate (above 60 percent cacao), semi-sweet/bittersweet chocolate, milk chocolate and white chocolate (white chocolate is not a problem as it contains none of the dangerous methylxanthines found in true chocolate products). 3. The amount of chocolate your dog consumes plays a part. Small dogs are affected by smaller amounts of chocolate than large dogs. For instance, a 50-pound Lab will probably be fine even if he eats an entire Hershey’s milk chocolate bar, but if a Chihuahua ate that same milk chocolate bar, she could be in trouble. That said, you should always call your vet or a poison-control hotline if your dog ever consumes any type of chocolate, even if you just think your dog might have eaten chocolate. “If in doubt, better to have the pet checked out,” Dr. Fausel advises. “Typically, the veterinary hospital will treat the pet for the potential toxin if there is a suspicion. 4. Yes, chocolate and dogs can be a fatal combination. 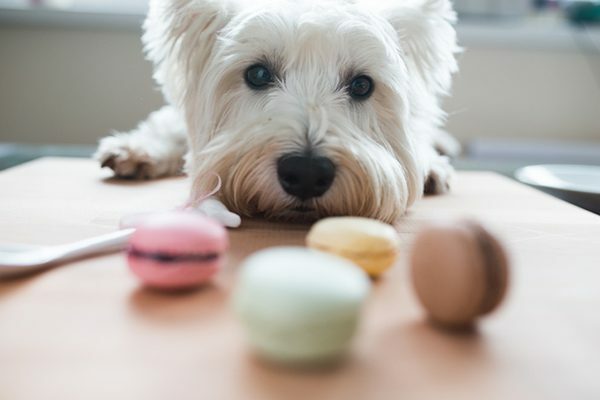 A dog eyeing some macarons. Photography by Indigo-stock/Thinkstock. 5. If your dog eats chocolate, time is of the essence. 6. Your vet might make your dog throw it all up. If not too much time has passed since your dog ingested the chocolate, the vet might induce vomiting to get as much out as possible, then administer activated charcoal, which absorbs the toxins so they can be expelled from the body. “The patient will typically be given intravenous fluid therapy at a fairly high rate to try to increase the rapidity of the elimination of the chocolate,” Dr. Fausel explains. 7. With quick treatment, most dogs will survive after eating chocolate. “As long as it’s caught at the earlier stages almost all patients will survive even fairly large ingestions,” Dr. Fausel says. 8. Chocolate is also bad for cats. Cats however, rarely try to consume chocolate. Felines don’t usually seek out sugary treats since they lack the taste receptors for sweet things. Can Dogs Eating Chocolate Cause Long-Term Health Problems? Egads! My Dog Ate a Giant Bar of Dark Baker’s Chocolate! 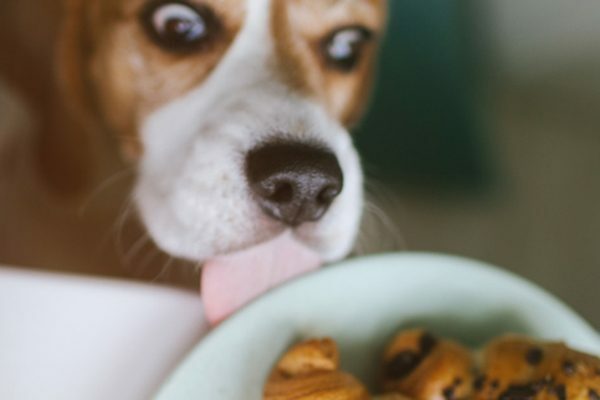 The post Chocolate Toxicity — Let’s Talk About Dogs and Chocolate appeared first on Dogster.